Hi, I am interested in your 1965 Buick Riviera (stock #1669-TPA) listed on Autotrader for $38,995. I'd like to get more information about this vehicle and confirm its availability. 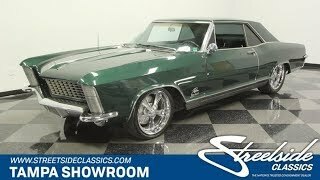 The 1965 Buick Riviera GS is one of those perfect classics. It has the cool-cruising attitude that comes from a premium nameplate, a truly interesting design, a great color combo, big V8 power, and the cool hidden headlights that were exclusive to the 65. No tailfins and minimal chrome gave the it a European flair that made the Riviera look like it was ready for the Riviera. Finished in correct code-J Verde Green, this one captures the sophisticated and subdued elegance of the design, and that allowed the many wonderful details to do the talking instead. With a professional repaint, theres a nice luster highlights everything from extended fenders to the Coke bottle sides. Brightwork was applied more sparingly than its 1960s contemporaries, so it was used as an accent piece in places like the delicate wrap-around bumpers, cool bombsight hood ornament, and rocker trim. They even added extra flair with the polished Coys alloys. But your favorite piece of brightwork is going to be those tall stacks on both of the front fenders that conceal the headlights. Its the only time this was available in the first generation, but its a styling cue that would became a Riviera hallmark. The Riviera was all about providing individual luxury, and this coupe does a great job of showcasing that today. The green interior coordinates quite nicely with the exterior, and the button-top pattern on the seats are a classy design that are presented just as nicely today as in 1965. Everyone gets plenty of wood-like trim and an individual bucket seat. Yes, theres a center console not only for the front, but even the rear passengers get a stylized separation. You even have the option for added comfort with provisions for features like R134a air conditioning and power windows. Theres even a power drivers seat. Just like the exterior, the brightwork is used for accenting instead of overwhelming, so the instrument panel is a fantastic display of elegant restraint. You get an upgraded wood-rimmed steering wheel that gives you a commanding view of brushed stainless round gauge package. And just to your right, the gearshift feels like a little piece of art that reminds you that the Buick was built to be driven. With a car this special so far, its great to see the an era-correct V8 under the hood. Buick knew that effortless performance was the key to the Rivieras success, so they made sure that there was plenty of torque on tap to move all that sheetmetal with ease. With 425 cubic inches, a four-barrel carburetor, and an advertised 465 pounds of torque, it gave this personal luxury car the ability to humble some pretty serious machinery out on the streets. The engine bay is clean and has some nice upgrades like the Offenhauser valve covers and coordinating ribbed air topper. The overall presentation under the hood points to nice investments in keeping this Buick running smoothly. And speaking of smooth operation, the TH400 three-speed automatic transmission, power steering, power brakes, and Rivieras legendary supple ride make this the easy choice for weekend cruising day or night. Complete with owners manual, this is a distinct classic coupe that still know how to be a personal luxury machine. Dont miss out, call today!